Modern society lives and works with toxic and combustible gases and vapours every day. Today gas represents an economic, technical and convenient medium, but left unchecked gas can rapidly become a significant hazard. KIMESSA gas monitoring systems can prevent the uncontrolled release of gases in boiler and CHP plant rooms. Gas leaks may develop at heating units due to the failure of seals, damaged pipes, accidental impacts, etc. Early detection is critical. 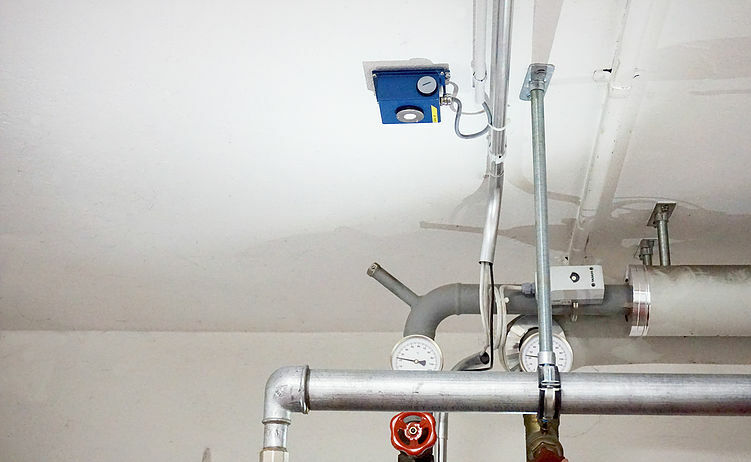 The activation of a gas monitoring system can shut off the gas supply via a gas solenoid valve to switch off the burner, alert personnel by local sounders, signal a BMS and or fire panel and log the gas alarm by time and date in the CANline monitor. For reliable monitoring, KIMESSA gas detectors are designed for zone 1 or zone 2. The BUS mounted CWED 68 programmable sounder beacon with display or the Touch Screen displays can be installed at the entrance to the heating plant room allowing for easy viewing of the ambient gas levels with colour coded bar graphs to facilitate easy viewing of the gas monitoring status. All measurement data and alarm events are recorded. In non-Ex rated zones, the BUS KSPC 121 pellistor based combustible gas detector suitable for natural gas or LPG, in a robust metallic housing, designed for one-person calibration and features zero and span potentiometers. The BUS KSEC 504 carbon monoxide detector will rapidly detect the presence of toxic CO gas, a by-product of in complete combustion. The KSEC 504 mounts on the same BUS cable as the KSPC 121 combusstible gas detector. The explosion hazard zone determines the type of detector used: The KSS 113 Ex (semiconductor) or the KSP 121 Ex (pellistor) are used for zone 2. For Zone 1 the explosion-proof gas detector GSPM 121 Ex is used. Touch screens can be mounted at the entrance to the plant room for visualization and rapid assessment of the system status. All measurement data and events are recorded and can be reproduced and analysed at all times. 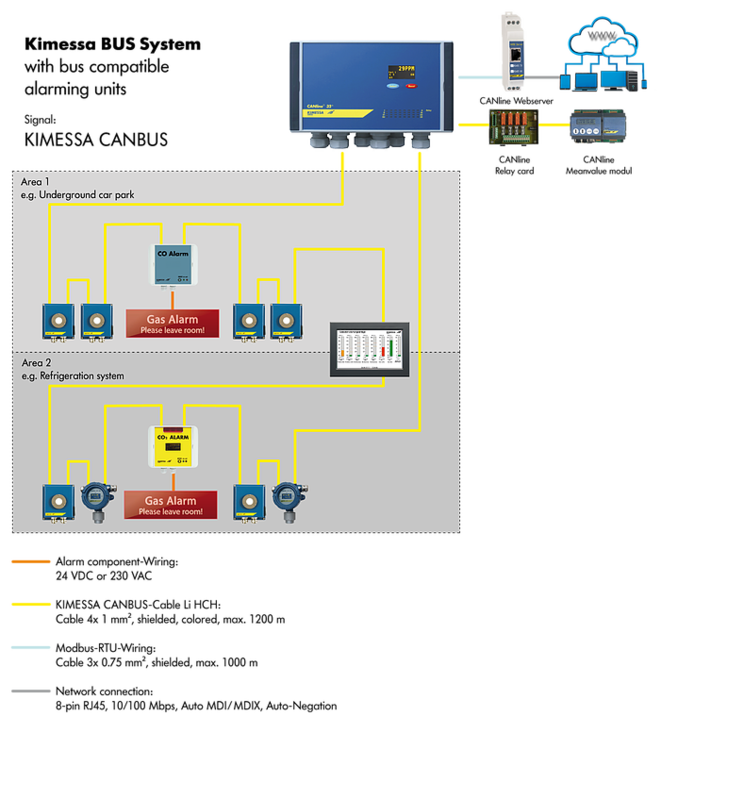 With the Plug’n Play capable Web server CWS 101 “Easylog” gas concentrations are visualized in real time on a computer network, enabling events such as alarms or faults to be sent by email to the responsible personnel. With the gas monitor, gas detectors and alert components KIMESSA systems offer comprehensive safety and precise measurement. A correctly configured gas monitoring system combined with the high quality of KIMESSA gas measurement and control devices guarantee the sought after level of safety. The technical expertise of KIMESSA and their representatives, as well as years of practical experience provide the user with an optimum solution. We can also offer unique and optimized products for plant room heating systems, such as the type-tested BUS-Ex Transmitter with an extremely reliable infra-red measuring principle. BUS installation provides cost savings up to 50% against conventional star cabling. Our detector housings are fabricated from welded stainless steel and are extremely robust. We also integrate all signalling devices onto the BUS. For example, the LED alarm signs and sounders can be integrated into the BUS with significant cost savings on cabling. In addition to the applications already described there are very many other areas of use for KIMESSA gas monitoring systems. As a total solution provider in the field of gas detection technology and gas detection we offer individual, tailor-made solutions for virtually any requirement of stationary gas detection. We will show you technically sophisticated gas monitoring solutions which you can rely on at all times.